Providing a free bespoke service, Finishing Touches By Adele specialise in producing handmade Wedding Stationery and Favours. We can also supply you with beautiful venue decorations including balloons, Table Linen and Chair Covers. At All Event Hire we specialise in hiring the most funky and exciting furniture from the world’s elite designers, such as Philippe Starck, Arne Jacobsen and Karim Rashid. 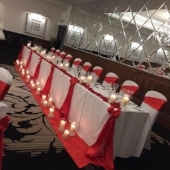 Whether you’re looking for chair hire or table hire, we supply furniture hire in Scotland and the UK, so we’ve got you covered. Our furniture ranges from the illustrious Ghost Chairs, Gliss Stools and Barcelona Tables to our wonderfully playful illuminated furniture for both indoor and outdoor events. 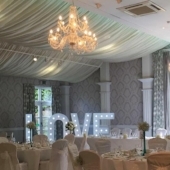 LG Wedding and Event Hire specialise in beautiful graceful Venue decoration, competitive pricing and most importantly superior customer service. Crest Events is a dedicated team with years of experience providing photo booths for hire and dance floors for weddings, parties and events. All our photo booths are top of the range and come with all features enabled as standard along with a great price it will make your wedding extra special. Big Day Bunting makes gorgeous bunting for you to Hire for your Special Day. All made in Scotland to a high standard; double- sided, with 'industrial' tape. Callyboo provides handmade, personalised signs to decorate your big day. From freestanding name or Mr&Mr / Mrs&Mrs signs for your top table or cake display, to personalised love hearts with your names and a special message which are ideal for a flower girl or page boy to carry. We also make love hearts for dogs to wear, which are a great way to include your fur baby in your big day! Welcome to Party Smart, we are a professional venue dressing company based in Rowley Regis in the West Midlands. We are a one stop party shop for every celebration! We offer a friendly service and will help you personalise your perfect day whether it be a wedding,civil partnership, birthday, christening, baby shower, engagement or corporate event. At party smart our trained and fully insured team will turn your celebration into a memory that will stay with you and your guests for a lifetime. The most beautiful and memorable events always have special design touches, even if they are little ones! They can help you with everything from: Furniture, Bars, Soft Seating Areas, Table Centres all the way through to full event styling and design. The Event Hire Company is renowned for its ability to infuse each of their client’s personalities or corporate traits into each individual event. Orchestrating mesmerizing corporate dinners, romantic weddings and private soirees that take your vision and turn them into reality, always with a will and ability to exploring new ideas in event spaces. Whether you are a bride and groom, corporate client or planning a private special event, you can breathe easy knowing that by hiring The Event Hire Company you will be working with an experienced, creative company that has a passion for each and every event. Our Paperpoms, Giant Flowers, tassels & Garlands are all handmade bespoke in London. We will make your day incredibly special and our service and delivery is impeccable and reliable every time. Constantly featured in press: Comso Bride, Brides, Wedding Magazine, You & Your Wedding, Wedding Flowers, Homes and Antiques, wedding blogs. Poms are sold ‘flat packed’ so if you are Marrying abroad. Tie them to chairs, trees, gazebos, marquees, beams, carry a bouquet of poms, make a garland or wear them in your hair. My Paperpoms are made of up to 80% recycled tissue paper, 100% recyclable and reusable. Lights to De-Light – Sweets to Treat. Create the wedding atmosphere you so rightly deserve with our fantastic light-up letters, chocolate fountains and sweetie wheels. We have the equipment and experience to transform your venue and make the best impression that will have your guests raving about it for years to come. So don’t delay – contact us today for a quote. Create the romance and ‘Wow’ factor at your wedding with specialist lighting and drape hire. From star-lit entrances to fairy-light ceiling canopies, subtle up-lighters to dazzling light curtains, Party Lights offers a comprehensive range of lighting effects for events across the South West. An established online retailer with an impeccable reputation, the tablecloth shop supply a full range of high-end and luxury tablecloths, many of which are ideal for use at weddings of all shapes and sizes. If you’re looking for a dedicated and passionate company that can help you to decorate your venue in the style of your choice, irrespective of personal tastes, then you needn’t look any further! Sami is recognised for her stylish and individual approach to venue transformation. At Verdigris we offer a personal design service, listening to what defines you as a couple and working with you to create a distinctive event that gives you and your guests a truly magical experience. Our mix of solutions include: table dressing, bespoke hand made props, ceiling centrepieces, drapes and lighting as well as sound and sensory elements. We can provide flowers and furniture if required or liaise with your chosen suppliers.